Our student body is about 70 strong at present. 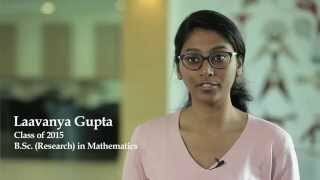 It is a vibrant collection of undergraduate and graduate students, with a variety of mathematical and other interests. Our students have their own Mathematics Society which organises both academic and social events. Our BSc and MSc programs began in 2011 and our students have gone on to higher studies in excellent institutions in India and abroad, or to jobs in industry. While at SNU, they have been selected for national programs and summer fellowships. Our first PhD admissions were in 2014, and our research scholars have achieved good publications and talks/poster presentations at conferences. We expect our first doctoral degrees to be awarded in another year or so. Aarushi Chawla has been placed with Xceedance, an insurance consulting firm. Namit Batra has been placed with BYJU'S,an education technology company.